Come to the Tech Fashion Show and support your fellow C-Dubs! Photogenic crowd that we are, three of us (and maybe more) have been given the honor to model for our dear Techies’ clothes: Hazel, Beyleigh, and yours truly! Tech’s only show of the year (though we know, actually, that every show is theirs), it will be spectacular, if last year’s somewhat trial run is anything to go by. Awesome music, cool lights, and attractive people strutting their stuff, what’s more to ask more? Let’s not forget the clothes, either. Especially the clothes. 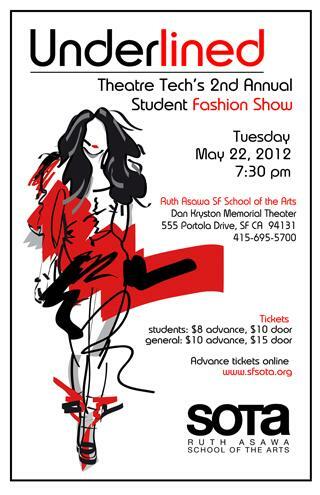 The Ruth Asawa SF School of the Arts Technical Theatre Department’s 2012 fashion show, UNDERLINED, is a dynamic collection of pure talent. Design students showcase their creative style and skills. We invite you to step inside our world, see how we work, and what we create. Guest MC is Matt Travisano. Join us for a reception after the show with special guest Associate Dean and Professor of Costume Design at SF State University Todd Roehrman. On the same day is the Creative Writing senior celebration! Don’t forget to RSVP if you haven’t already– it’s common courtesy, after all. We’ll see off our beloved seniors in style! CW Alum at an Oakland Reading!